Simply by Ti Fabrics recently let me pick one of her new open weave fabrics to try out. I chose the Black Crochet off of my wishlist with plans to do a pattern hack similar to this with the Blanc Tee. I altered my plan though, once I had the fabric in hand. I was picturing a thin fabric more like lace (though I don’t know why), but this turned out to be just a bit heavier and thicker than the Hacci sweater knits I’ve used in the past with a similar mechanical stretch. The fiber content feels like a cotton or other natural fiber and is really soft. 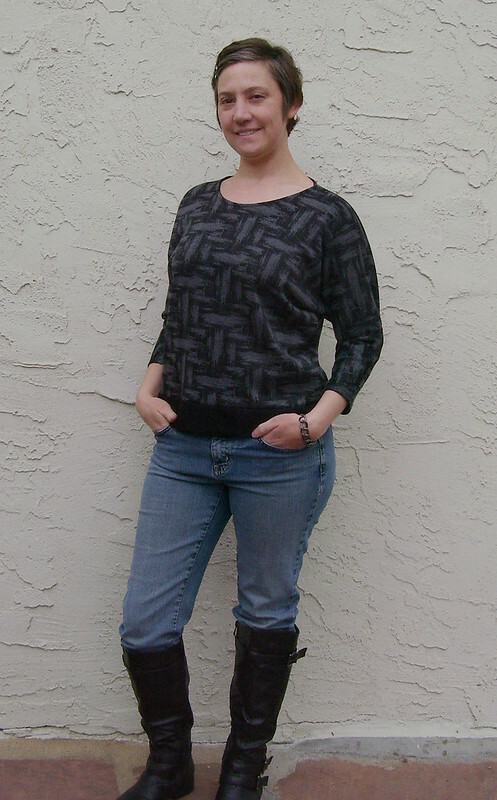 New plan: Use the Toaster Sweater to create a transitional spring piece that I can use for a lacey looking top. My initial thought was that I would need to stabalize all the seams so the open weave wouldn’t pull apart and ruin my piece. I decided to eliminate the cuffs and bottom band to minimize the number of seams that I would have to treat in this way. I simply extended the bodice and sleeves to make up the difference. It turned out I didn’t need to stabalize all the seams after all. I did a test run through my overlocker on some scraps, played tug of war with them, and I have no worries about these seems. I did decide to add a strip of knit jersey as I sewed the neckline to give that seam some extra support. Here you can see how I folded it over to encase the neckline seam. For the hems, I did a double fold hem with a hand catch stitch for a nice looking finish that would have some stretch to it. The Pattern: Toaster Sweater 1 from Sew House Seven paired with my Goldenrod skirt. I can’t give a complete review here because of the changes I made and using an off book fabric choice, but I will share a few of the first impressions I had of the pattern. The pattern is pretty basic and the use of bands and cuffs eliminate the need for hemming, making the construction really easy. A sewing newbie could easily sew this up. I personally could have done with a more condensed version of the instructions. Does your fabric sometimes throw your plans for a loop, how do figure out what to do? *Simply by Ti provided the fabric for today’s creation in exchange for a review. These are my honest thoughts on the fabric. I’d like to thank Marta of doguincho for posting her beautiful Miss Marlene top and fueling the flames of inspiration for today’s Stripey Boatneck top. Inspiration often languishes on my pinterest boards for lack of pattern or just the right fabric. Not this time though. 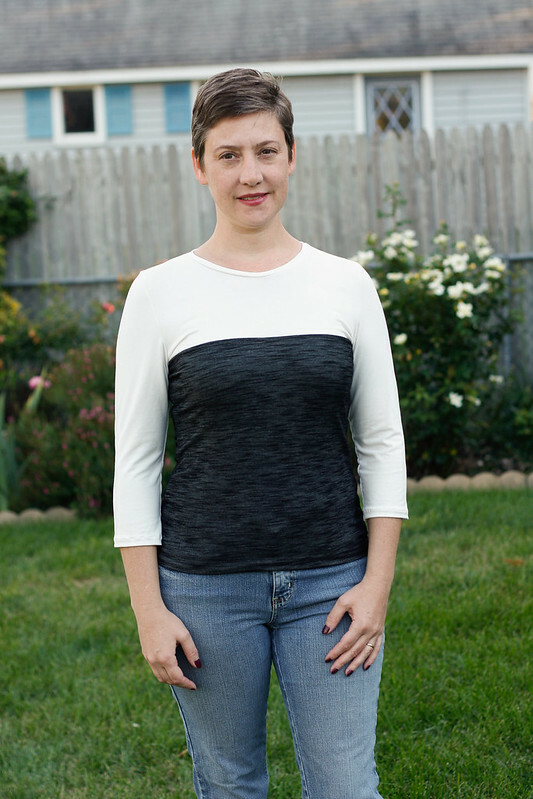 I have my TNT boatneck pattern (Butterick 6084 oop) at the ready and Simply by Ti Fabrics let me pick this wonderful rayon in ivory and black stripes to feature in a blog post. The Fabric: Rayon Spandex in ivory and black stripes from Simply by Ti. I love the drape of rayon, but it comes with the drawback of being a little clingy, a bear to sew, and I’ve been burned by instantly piling fabric. 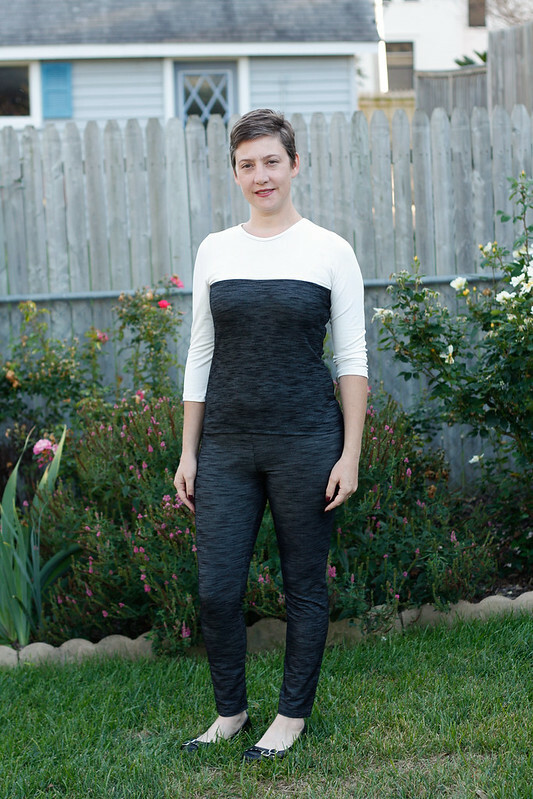 What I like most about the rayon from Simply by Ti is that it is a little heavier than the other rayon spandex blends I’ve used. The heavier rayon knit is a just a smidge easier to sew and press, is not as clingy, has the opacity I want in a light color, and still drapes nicely. I think with every rayon I’ve used before, the fibers start to lift or pill right away- very annoying. The surface of Ti’s rayon is still perfect after washing and manipulating. I’m very pleased. The inserts are a super stretchy, shiny cotton blend that I saved from shortening some rtw pants. I thought they looked like faux leather, so I kept them for a time such as this. A very simple pattern hack, some scrap busting, and viola; I have a modern twist on a very classic look. The Pattern: Butterick 6084 oop. To make space for an insert, I dropped the shoulder seam point by 1/2in on the front and back bodice pieces and smoothed out the neck lines on the pattern pieces. 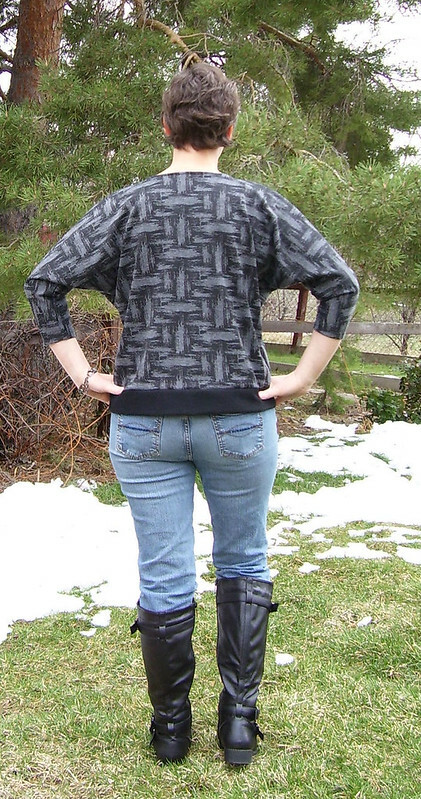 I folded over the hems for front and back necklines stabilizing with knit-n-stable from Pellon. Next I positioned my shoulder inserts, leaving 1 inch between the front and back bodice at the shoulder and pinned in place. 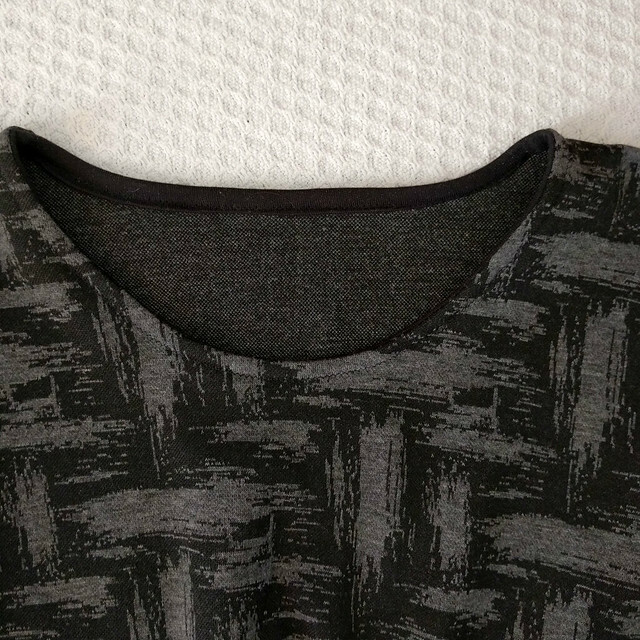 I then stitched my necklines through all layers and proceeded to finish the tee according to the directions. Next time, I would sew the inserts in differently, as the neckline tends to stand up and roll forward along the inserts, but I can live with it. As always, thanks for stopping by today, and join me next week for the Breaking Ground Blog Tour. *Simply by Ti provided the fabric for today’s creation. These are my honest thoughts on the fabric. 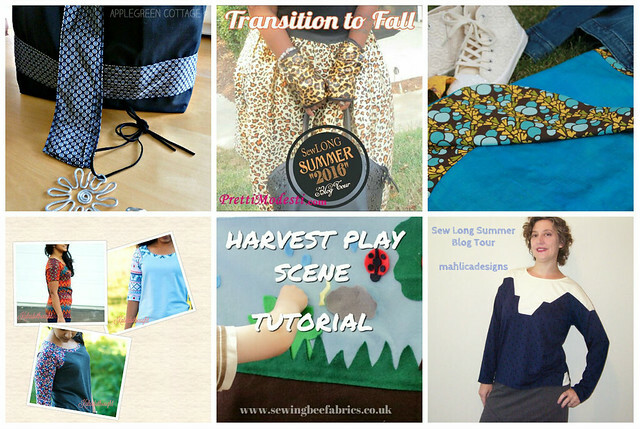 I’m saying Sew Long Summer by dusting off my fall sewing wish list and making it happen. One of the projects on the top of my list was to make another Zircon Sweater from Paprika Patterns. The inserts on the Zircon let me have two of my favorite things; geometric shapes and high contrast colors. I’ve made the Zircon before, so I knew no alterations were needed. Take note that the Zircon sleeve is supposed to be bracelet length, but hits my shorty self right at the wrist were I prefer it. Those inserts might look scarey to make correctly, but if you follow the directions and take your time to line up the stitching lines, you’ll be good to go. Stop by today’s bloggers for more inspiration. 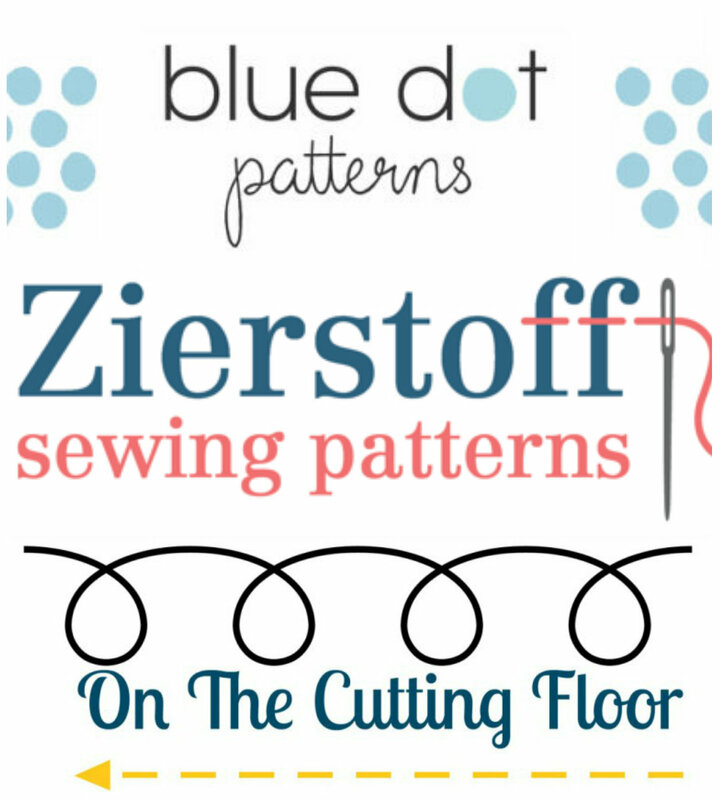 And…enter our giveaway for a pattern from On the Cutting Floor. On the Cutting Floor is putting out some really interesting patterns, with unique details that take them above and beyond the many basics you see out there in the Indie pattern world. I have many of them on my list to make. I started with the Sarah Top and Dress Pattern** Those origami-like folds, oh yeah, so very cool. I had the perfect color ponte in my stash to fit into my Core Wardrobe too. 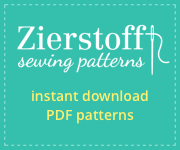 The pattern comes with lots of options, 24 all together, so you need to read the “How to Print” instructions to get the pattern pieces you need. The easily understandable instructions walk you through how to complete the many options and they’re organized so there’s no confusion. Sewing the pleated panel was a breeze because of good markings and clear instructions. Item of note: The curve from waistline to hip is not a gentle one. This is great for pear shapes like me, but if you’re a rectangle or inverted triangle shape you might want to check that. My alterations, which I have to do to most patterns. A drop shoulder adjustment of 3/8in. Shortened 3in at hem line, I had to eliminate the bottom pleat to make it look right. Shortened the sleeve by 3in to make it a length I like. Next time, I’ll use a binding on the neckline instead of folding over and topstitching. I prefer a binding or facing. 1. I got a lot of gaping at the center front neckline of my muslin (not shown). I ended up removing two 1/2in wedges from the neckline to compensate. 2. I found the neckline sat high up on my neck at the shoulder line. I ended up removing 1in here. 3. I found the front piece 1/2in narrower than the back piece in the same size. I used a size 10 front piece and size 8 back piece in my final version. 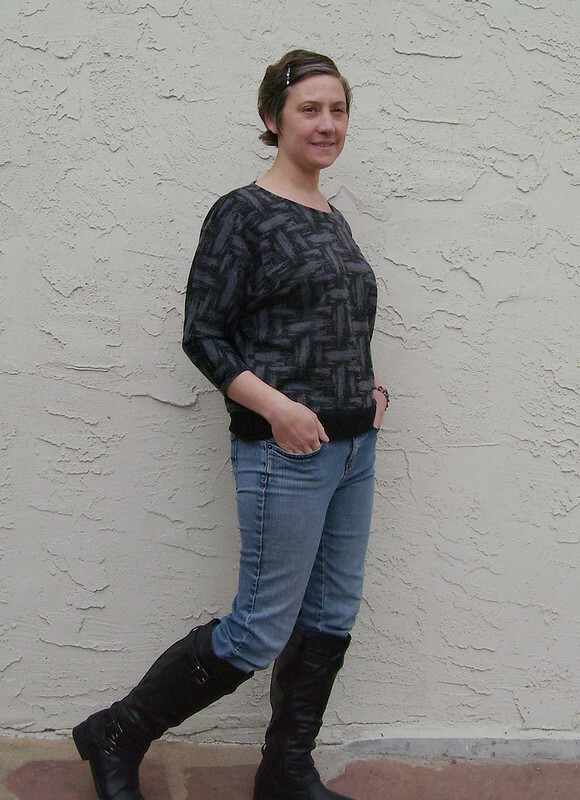 The Pattern: Sarah Top and Dress in size 8/10. Pleated front, short sleeve options. The Sarah Top & Dress is 50% off until Friday to celebrate the pattern release, so hop on that now. The pleated front, short sleeve version of the Sarah Top should take you about 1.5 hours to complete. **Affiliate link, meaning your purchase provides me a modicum of compensation to fuel my hobby. 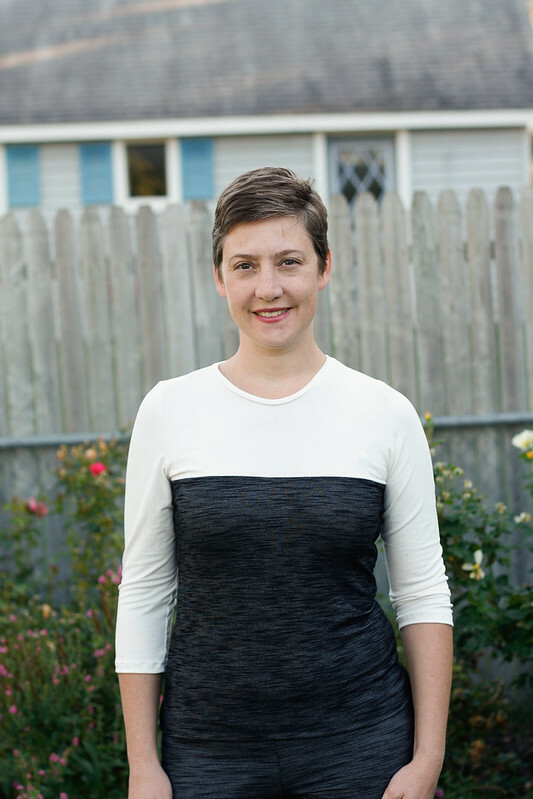 Today I’m sharing the One Hour Top from Fancy Tiger Crafts as part of the Diving into Dolmans blog tour hosted by Sewing By Ti. Ti has put together bloggers of all shapes to show how this style top can work for every body shape. Sew Sophie Lynn as a rectangle. 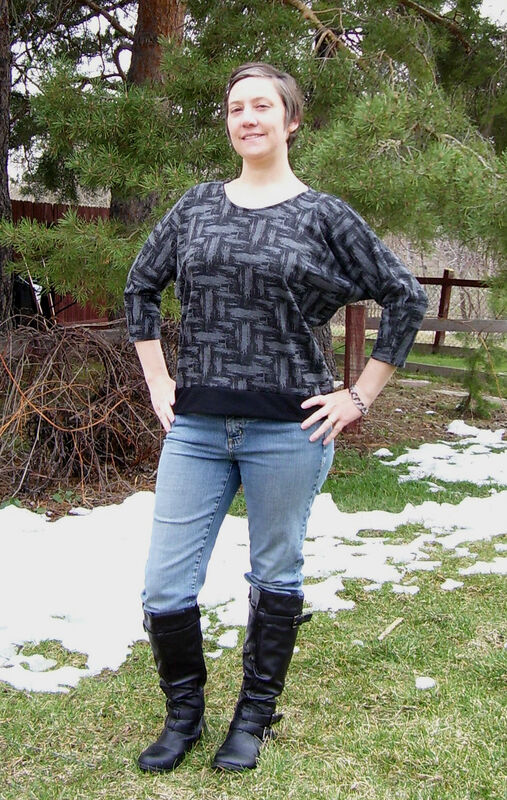 I just love my dolman style Georgia Tops (here and here), so it was only natural that I would want to try another pattern and expand my dolman love. Unfortunately, I did not find true love a second time. I think we’re more of a “like-like” status. The blandly named One Hour Top is a loose fitting top with a 3/4 length dolman sleeve. True to it’s name, the top goes together very quickly. The instructions are easy and straight forward to follow. I did change one step. Instead of folding over the neckline by 1/2in and stitching down as instructed, I used a clean finish binding. Even with the extra time needed for the neater neckline finish, I still finished in under an hour. I found this really cool ponte knit on the clearance rack at Hancock Fabrics, but it was a bit shy of the needed length, so I added a color block band at the bottom to make it a decent length on me. As is usual for me, I had to shorten the sleeves just a bit to hit at the right place. I was worried that a dolman without a fitted band at the bottom would look really slouchy, but that turned out just fine. The overall fit is just not love for me, as roomy as this is supposed to be, I’m getting drag lines down the front. I often need a FBA, but honestly didn’t think I would need it with as much ease as the pattern has built in. I’ll pass on making this one again. You may have better luck. I made a size small with a few adjustments to the pattern this time. I raised the neckline by 1in at center front, narrowed the neckline by 1/2in at the shoulders and drew a new neckline curve. I also shortened the sleeves to about 17in finished length to make a 3/4 sleeve. For the color blocked portion, I used one of my previous versions to determine where I’d like the new sewing line to be, retraced pattern pieces and added seam allowances. I also noted where my center bust point was so I could slightly curve the color block line down from center bust to about 1/2in lower at the sides. It didn’t quite come out as hoped. Next time I’ll move the sewing line up a little more above my bust and redraw the curve to be more noticeable. I also learned to consider stretch more carefully. 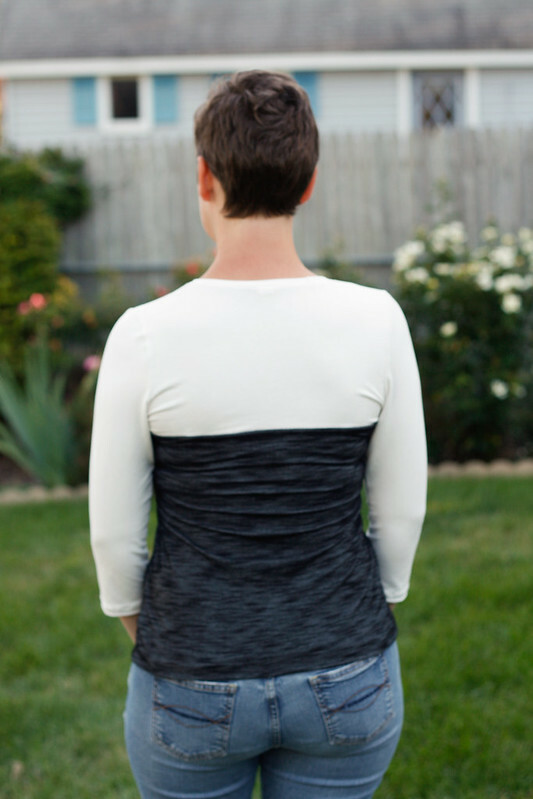 The stretch in the top fabric is much less than previous fabrics used and pulls across the top of my shoulders. The Tonic 2 Tee should take you about 2.25 hours cut to finish, plus time to redraft your pattern. I also entered my Tonic 2 into the Sewing Indie Month contest. Holi-Daze week for my Sew Long Summer sew along was a bit of a challenge sewing wise. I was hoping to make a big batch of tees or undies, but it just didn’t happen. Weekends are not where I get my sewing time, so I just barely finished the Jalie cardigan I was working on to show off with my sewing tips post. I’ve had the Jalie Drop Pocket Cardigan on my list since I saw Jamie’s last December. I’ve also been seeing Hacci knits around and wondered what they are like to sew and if using one would give me a warmer cardigan. The jury is still out on the warmth; it’s not quite cardigan weather yet. 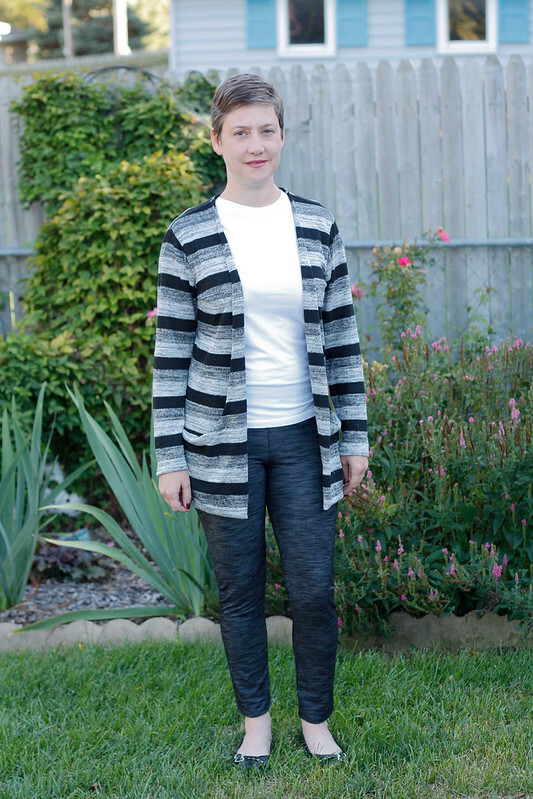 I purchased my Hacci sweater knit from Girl Charlee during their July 4 sale. A little about the pattern. Jalie patterns come on a large sheet for you to trace off and include a huge range of sizes. The seam allowance on this one was pretty narrow at 1/4inch. Since I was using my serger I was ok with it, but otherwise I would recommend you think about adding more of a seam allowance as you trace. The pattern is put together to enclose as many seams as possible, because of this there were points in the instructions that I definitely would have been lost without the diagrams, so have both handy. The pattern is a fabric hog, needing four of the front pieces shaped like a big “L” so the pocket part folds over the front. With stripe matching and my best pattern Tetris skills, I got a size U for 36in bust out of 2.25 yards (60in wide). Hot Tip: Check your length before you cut. The pocket does not allow for much to be just cropped off the bottom if you forget. Working with the Hacci sweater knit was very similar to working with a jersey knit; a little rolling at the edges but no fraying. I had some trouble getting the tension adjusted on my Janome 4618LE sewing machine to handle the stretch of the Hacci, but had no problem using my serger for the majority of the construction. I would think twice if I only had my machine to use. 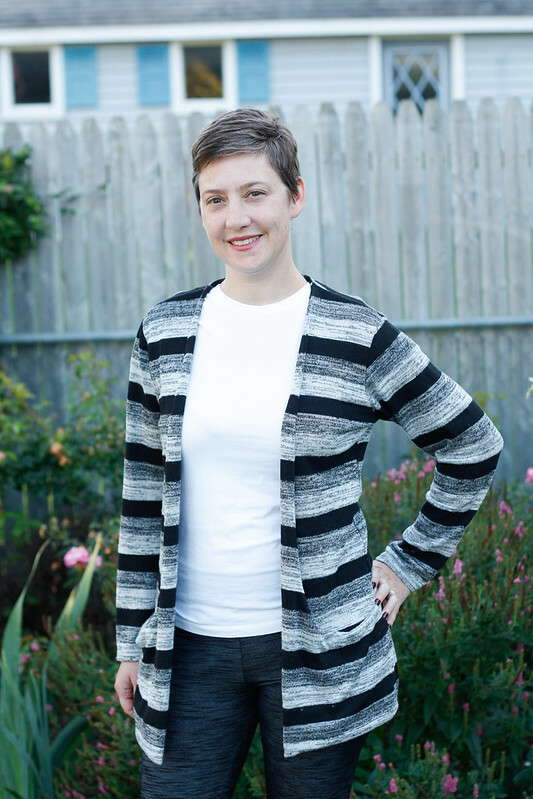 Jalie’s Drop Pocket Cardigan should take you about 3.5 hours cut to finish.